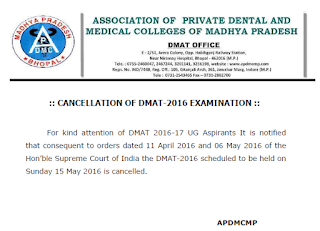 Association of Private Dental and Medical Colleges of Madhya Pradesh (APDMC) is going to conduct DMAT 2016 for admission to MBBS, BDS, BPT, BOT, B.Sc. Nursing and Other Allied Paramedical Courses for the academic Session 2016-17. The written exam is scheduled to be held on 15 May 2016. For appearing in this test, aspirants have to download the admit card from below. The Admit card of DMAT will be released around 7 days before the exam. Those candidates who had applied, can download DMAT Exam Admit card from the direct link given below. Latest news: DMAT 2016 had been cancelled. 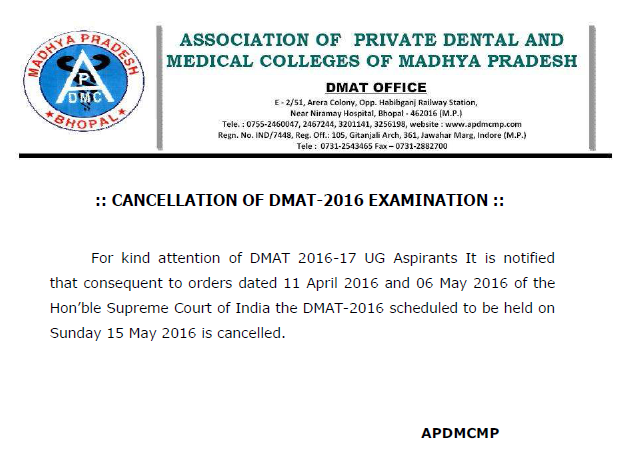 APDMC is going to conduct DMAT 2016 written exam on 15 May 2016 from 11:00 A.M. to 02:00 P.M.. For that, admit card are going to be released soon. Candidates have to download DMAT 2016 admit cards from the official website apdmcmp.com via the direct link given below. The test will be held at various centres in Madhya Pradesh State. All the important details like test address, roll number, reporting time etc. had been mentioned in them. The Reporting Time is 08:00 A.M. to 10:30 A.M. The written examination will be organized at Ahmedabad, Jabalpur, Bhopal, Jaipur, Delhi, Raipur, Indore, Lucknow, Gwalior centres. The candidates can download their admit card from APDMC website from here. The admit card of DMAT should be printed on a white paper and bring at the time of examination. Candidates should also check the Admit Card details carefully for name, Date of Birth, Gender etc. In case of any discrepancy, communicate to the APDMC Immediately for necessary correction. The candidate must show, on demand the Admit Card and Original Valid Photo ID (Voter ID, PAN Card, Aadhar Card Etc.) for admission in the examination room/hall. In order to download the admit card for DMAT exam, candidates need to visit the direct link provided here (after release). It will take you directly to download page. Then candidates need to enter their registration details and click submit. Their DMAT Admit card 2016 will be shown and a print should be taken.